Well, well, well. Tsk, tsk. Medical science has to eat yet another mistake–the idea that the appendix is just a rudimentary appendage. The conventional wisdom for years has been that the appendix was nothing more than a remnant of a bygone developmental stage. As a result, doctors have been quick to remove it; a routine surgery they call it–an appendectomy. 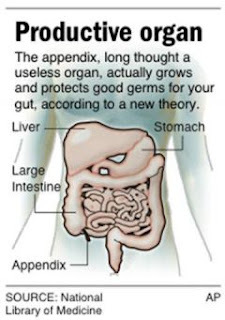 But this news just in: Scientists now believe that the appendix produces and protects good germs for your gut. I knew it, I knew it. There’s just no way, through millions of years of evolution, that we would continue to form a “useless” appendage. Evolution does not work that way. Anybody remember the so-called uselessness of the tonsils ? Mm hm, I lost mine back in 1972. They were also considered unnecessary–that is, until medical science realized their importance in immune function. Duh. Can I have my tonsils back please? I also lost my useless appendix last year, one month following the birth of my daughter (I couldn’t let my wife get all the attention, now could I?). I never felt real easy about the situation. I mean, it is attached to my colon; it must do something. But we didn’t know what. Now we do. It provides the normal flora of our gastrointestinal tract–the same stuff that helps prevent the overgrowth of opportunistic organisms like fungi or other bacterial species. If the normal flora die or get purged–like through amoebic dysentery, cholera, or the overuse of antibiotics today–then the appendix simply reboots the system. Nice. Isn’t the human body amazing? For me the take home lesson is this. Man is not smarter than Mother Nature (please read my article on Innate Intelligence). Just because we can’t figure something out does not mean it doesn’t exist; or in the case of the appendix–doesn’t have a function. Isn’t it wiser to assume that there is a function to every body part and that we should try to save them until we figure it out? Well, medical science is making sure to cover their bases. The authors of the paper on the role of the appendix have made sure to point out that the function of producing good bacteria is “not needed in a modern industrialized society”. According to Duke surgery professor Bill Parker, a study co-author, “If a person’s gut flora dies, they can usually repopulate it easily with germs they pick up from other people. But before dense populations in modern times and during epidemics of cholera that affected a whole region, it wasn’t as easy to grow back that bacteria and the appendix came in handy.” Yeah, I’d say that too if I was teaching people the finer points of yanking organs. In any case, there’s no doubt that an inflamed appendix (appendicitis) can be deadly. So I’m not too upset about losing mine. However, I still think that working to find an alternative solution to treating appendicitis should be studied. Until then, conventional wisdom will continue to see the appendix as extra baggage.